From the very dawn of country music in 1923, and from the first successful bluegrass in 1940, there's always been a special connection between high-balling trains roaring through the night and a bluegrass band slicing through the smoke of a Cincinnati bar like a white-hot laser. 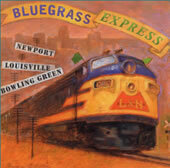 Welcome to our look at the magic and special relationship between bluegrass and trains. For years, musicians have marveled at the energy, the dynamics, the discipline of a southern flyer cutting through the soft southern night. For generations, from Bill Monroe's early recordings to modern award winner Lynn Morris, bluegrass musicians have sought to capture the speed and beauty of one of the most exciting chapters of Americana. Website by Wild Blue Pixel.